Jeremy is an attorney in our Litigation, Insolvency & Restructuring Group where he specialises in commercial litigation including fund, property and probate litigation, as well as a wide variety of contractual disputes and tortious claims. He also has experience in insolvency/debt restructuring, compliance and regulatory law. 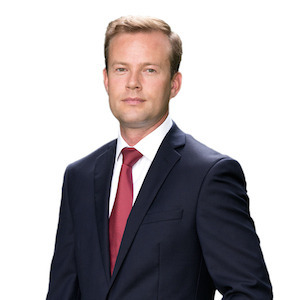 Jeremy obtained his bachelor’s degree in commerce in Canada before moving to the Cayman Islands to undertake the first two thirds of his LLB (Hons) degree. Thereafter he completed his law degree in Liverpool, United Kingdom and was subsequently admitted to the Bar of England and Wales in 2008. He then worked out of a leading set of Chambers in the Northwest of England. During his time in the UK Jeremy obtained extensive advocacy experience in the first instance and appellate courts relating to all manner of cases including personal injury, commercial disputes, white-collar crime and fraud. Pre-emptive remedies including freezing orders and other interim relief.